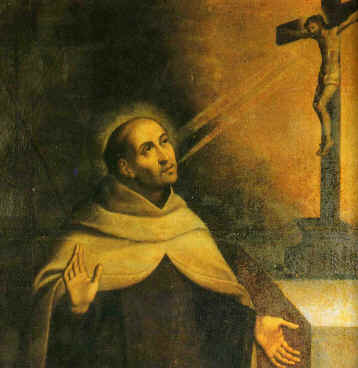 O glorious St. John of the Cross, through a pure desire of being like Jesus crucified, you longed for nothing so eagerly as to suffer, to be despised, and to be made little of by all; and your thirst after sufferings was so burning that your noble heart rejoiced in the midst of the cruelest torments and afflictions. Grant, I beseech you, O dear Saint, by the glory which your many sufferings have gained for you, to intercede for me and obtain from God for me a love of suffering, together with strength and grace to bear with firmness of mind all the trials and adversities which are the sure means to the happy attainment of all that awaits me in heaven. My glorious father St. John of the Cross; overflowing with love for Mary and for the cross of her divine Son by which you merited to become the protector of afflicted souls, obtain for me from Jesus and Mary, I beseech you, an unwavering faith and a love of the cross so deep and so valiant that no possible misfortune will ever be able to separate me from the love of my God. Obtain for me also the special grace I ask through your intercession during this novena if it be for the glory of God and for my salvation (make request). Glorious St. John of the Cross, you preserved to death in unspotted brilliancy the radiant whiteness of your baptismal innocence, while nevertheless practicing the most cruel and persevering penance. In honor and imitation of this crucifying love, I entreat you that I may share your mortified and penitential life so that, even in this world, I may receive the grace to atone for my many sins, purify my soul, and acquire merit, that I may also enjoy heaven’s glory with you. Obtain for me also the special grace I ask through your intercession during this novena, if it be for the glory of God and for my salvation (make request).